Most people know about Honus Wagner because of the famous T206 baseball card*, the most expensive one in the world. Only 57 copies are known to exist, and only a handful are in decent condition. In 2013, one of the cards sold at auction for $2.1 million. *Grantland has an excellent feature on the card. It is easy to forget that Wagner was the game’s first superstar, in the era right before Ruth and Gehrig and Walter Johnson. He debuted in 1897 and hit .335. In 1900, he hit .381 and won the batting title. He would win seven more – this was when batting average meant something. Wagner finished his career with a .328 average and 3,420 hits, which is sixth all time. 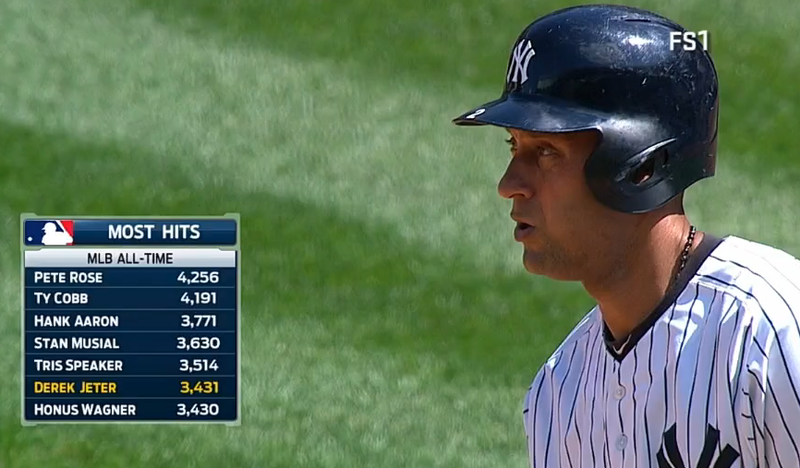 On Saturday, Derek Jeter passed Wagner on the all-time list. And, um, wait, what is going on here? Why does it say 3,430? It turns out, Wagner’s hit total is a hotly contested topic. The Elias Sports Bureau is the official statistician of Major League Baseball, and they say 3,430 (seen above). Baseball Reference says 3,420. This is not a typo. Let’s travel back to 1969. At the time, official National League baseball statistics only went back to 1903. Well, this was one of the more progressive years of the century, and so in that epic summer of ’69 the Macmillan Baseball Encyclopedia decided to create new statistics for years prior to 1903. The changes were approved by an MLB committee. These statistics weren’t pulled out of thin air – they were very carefully checked and vetted and they even have daily figures to back them up. Baseball Reference adopted them. However, the Elias Sports Bureau never accepted the ruling (Elias has always used data from old Spalding Guides). From my research, it looks like the Macmillan data is the most accurate (here is a more detailed post). So I’ll side with Baseball Reference and my man Sean Forman on this one. In all likelihood, Derek Jeter passed Honus Wagner a few weeks ago.